The aroma of the mash or hops in the kettle and a pint of fine homebrew never get old. I was in college in the late 1970s, and believe me, things were bleak and desolate in beerdom. Where we stand today is a truly remarkable situation. I have been keenly interested in beer for the entire journey and homebrewing for the majority of it. This makes me no more of an expert than many others, but does offer me a better perspective than most. When my editors agreed that a short retrospective of my 28 years of experience as a brewer would be a fitting departure for the anniversary issue from the usual column, I began to reflect immediately on my personal pilgrimage, from wasteland to the promised land. Those moments of inspiration, curiosity, epiphany and serendipity were revisited fondly. Like most brewers though, I’m still pursuing that perfect beer, a quest that keeps my juices flowing. Homebrewing also introduced me to the business of beer, the inner circles of the industry and the opportunity to get to know many of the wonderful people who make their living at beer. I’ve always seen homebrewing as one means to understand the very essence of beer, much as a chef would view gardening or farming. To brew is to know and embrace the medium, process and duality of complexity and simplicity, and of art and science. Brewing is personal, expressive, consuming and satisfying. But in the end, it is still magical and fun after all these years. The aroma of the mash or hops in the kettle and a pint of fine homebrew never get old. On a grander and perhaps more significant level, it is important to remember that homebrewing was the very impetus that poured the foundation of microbrewing in the 1970s. It remains no less meaningful and influential today. By the time I moved to Houston in early 1987, I was already smitten with imported and microbrewed beer, having taken a few brewery tours in Northern California in the mid-1980s. I caught the brewing bug after discovering The Ginger Man, a pub in Houston with 40 draft beers. Right next door was Defalco’s homebrew shop, run by owner Scott Birdwell, beer savant and pied piper of all things homebrew. I recall my first visit. The shop was abuzz, and the aroma emanating from the bins of malt was as intoxicating as the draft homebrew I was offered. The vibe was neo-bohemian, something that still permeates the practitioners of the craft. I was hooked, the allure impossible to resist for a tinkerer and scientist such as myself. I picked up a copy of Dave Line’s Brewing Beer Like Those You Buy (a cult classic) and homebrew guru Charlie Papazian’s biblical tome The Complete Joy of Homebrewing, First Edition, and got busy reading. Michael Jackson’s Beer Companion, at the time an indispensable guide to beer styles, came a few years later. Jackson’s first-edition copy sits on my living room coffee table as I type. My beer library now numbers well over 100 volumes; my interest in brewing has never waned. A few weeks after poring through the original books, I scored two cases of swing-top Grolsch bottles at a garage sale, bought a basic kit the following weekend and put together a brown ale with nothing but canned Ironmaster extract and Muntons dried yeast. It was drinkable, good enough for me at the time. After a few batches and some invaluable guidance from the ever-studious, fun-loving and instructive Foam Rangers homebrew club, whose home base was Defalco’s, I tried my hand at all-grain brewing. By my estimation, there are more than 400 batches under my belt. Things are certainly different in many ways now. The wealth and availability of knowledge and array of gear and gadgetry are taken for granted. The selection of ingredients, especially hops and yeast, is mind-boggling, a far cry from what was around back in the 1980s. Though it was largely geared toward the professionals, we homebrewers have enjoyed the spoils of this commercial growth equitably and have had a significant hand in stimulating that prosperity. What’s not changed is the vigor, enthusiasm and attitude of the homebrewing community. As easy as it would be to pen a dissertation on the pleasures, romanticism and challenges of homebrewing, it is just as pertinent to appreciate the powerful and compelling impact that it has had on the creation and subsequent explosion of microbrewing. Homebrewers provided the roots that served as anchor, foundation and nourishment for the fledgling movement in the late 1970s, as most of the original microbrewers started as hobbyists. The avocation itself is a reflection of the professional industry and always has been, a coexistence typified by energetic, resourceful, pragmatic and inventive people. The beginnings were humble, as there were few turnkey small-scale brewing systems and instruction manuals. Brewers cobbled together dairy equipment, pumps and hoses to get the job done and learned on the fly. Moxie and elbow grease were as important as malt, hops, water and yeast. Those few pioneers coalesced into a nascent industry that not only resurrected, but also changed the face of brewing, thanks to those who took the time to learn the craft in the comfort, and probably mayhem, of their own kitchens or backyards. Many of those old-timers are still at it, and heroes to many of us. Even they had their own mentors, those who sowed the seed before wholesale microbrewing took hold. Jack McAuliffe and Fritz Maytag of New Albion and Anchor Brewing, respectively, served as commercial inspiration to those brave entrepreneurs of the first wave in the early 1980s, proving that America could indeed support an industry based on culinary craftsmanship, built from the ground up. And of all things, it was beer, something not exactly considered “gourmet” by Americans. The home/professional brewing dynamic has largely reversed, in my opinion. At first, it was homebrewing that spawned the industry. The beers brewed were basic, no-nonsense types gleaned from unfussy, traditional recipes brewed and honed at home. Now, homebrewers take their cues from the brewers at micros and brewpubs, those pushing the envelope, and providing blueprints for wild ales, lambics, Cascadian dark ales and Belgian IPAs. That bond between the two has not changed, though. Brewers never seem to forget where they came from and are happy to give back. On occasion, I run into somebody here in Durham, NC, at one of our popular watering holes who reminds me that the first “craft” beer he ever tasted was a homebrewed Belgian dubbel I made for a party about 10 years ago. Until then, he’d never had anything other than a macrobrew. He’s never looked back, and I suspect many homebrewers or beer lovers could tell a similar tale. 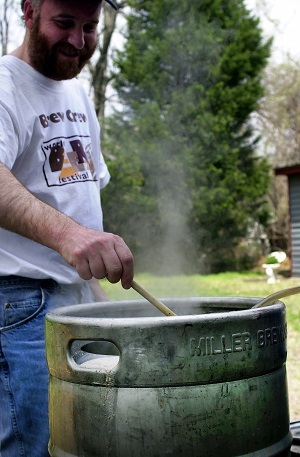 Homebrewing has opened the eyes of many to the world of beer. Contemplate for a moment the number of specialty beer stores, glass makers, hop growers, homebrew shops, gastropubs and taprooms, not to mention the 3,000-plus breweries and brewpubs that have arisen from the new appreciation for beer and their link, directly or otherwise, to the hobby. Hell, Rubbermaid, Igloo and Home Depot should have an annual Homebrewers Appreciation Day for all of the business they have gotten from us. Even micromaltsers are becoming more common. Homebrewing runs through the economy like lacing on a snifter of fine Belgian beer. Some day, my mash tun and kettle will find a new home with a brewer much younger than I. That day is far off, though. As of next year, I will have spent half of my life as a homebrewer, 29 years of my 58. Brewing has never been more enjoyable and rewarding than it is now. I am proud to say that I am part of the group that helped get this thing off the ground, and it continues to grow and prosper beyond my wildest imagination. On one hand, brewers are keeping history alive with traditional brews, while at the same time, exploring the new frontiers of an ancient craft. So raise a glass of homebrew and have a toast to those who have helped make the world of beer an infinitely better place than it was. Oh, and homebrewers, keep up the good work.